I always wanted a Miku Hatsune figure and when I learned that Sega is coming out a Pre-Painted Figure of Miku Hatsune at a very affordable price, I jump for joy! The figure is scheduled to be out on April 2010. If I am not wrong, this Miku stand at a height of 24 cm and it should be those Sega prizes for those UFO catching arcade machine in Japan (I could be wrong though). 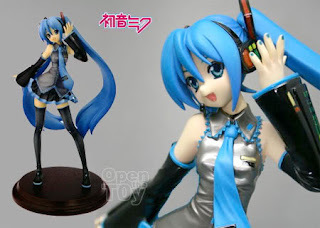 I am not too sure how blue she will be but for miku at that price, anything goes. Some more 24 cm tall. Hope not too plastic. I don't have a figma miku and I find this look better for posing than figma.